Since 2005, more than one-third of all licensed pharmacists (Jews and Arab Israelis) hold academic degrees from Jordan. In the study sample, there are large wage differences between female Jewish pharmacists and their Arab Israeli counterparts, apparently due to differences in seniority and management level. All of the female Arab Israeli pharmacists who were interviewed earned less than NIS 10,000 per month, compared to only 40% of their Jewish counterparts. In contrast, among male pharmacists in this study, there was almost no difference between wages of Jewish and Arab Israeli pharmacists. Work relations and daily interactions between Jewish and Arab Israeli pharmacists are described as positive and even lead to social connections and the lessening of prejudices. It takes a considerably longer time, on average, for Arab Israeli pharmacists to find an internship than their Jewish counterparts, especially for those who studied abroad. A new study conducted by Prof. Noah Lewin-Epstein, Prof. Alexandra Kalev, Erez Marantz, and Shimrit Slonim for the Taub Center attempts to examine how educated Arab Israelis integrate into the Israeli labor market. To do this, the research focused on the pharmacy field, where there has been an influx of Arab Israelis over the past decade – many of whom work in businesses owned and managed by Jews. The researchers pointed to the advantages of equal integration of educated Arab Israelis into the labor market and among them, the considerable contribution to the development of the Israeli economy and increasing interactions between Arab Israelis and Jews, which can reduce prejudices and may serve to reduce feelings of hostility. At the same time, the research also showed that the path of professional integration for Arab Israelis also includes several challenges – beginning with the internship stage and extending to limited opportunities for advancement. The authors suggest several policy steps to overcome the difficulties identified. The Taub Center study consists of in-depth interviews with pharmacists, managers and owners of pharmacies, and the quotes are taken from these interviews (all names are pseudonyms to protect the anonymity of the participants). By 2000, about 20% of pharmacists in Israel were Arab Israelis, a rate that is somewhat higher than their share in the overall adult population. Between 2000 and 2010, along with the overall growth of this field, there was an influx of Arab Israelis, raising their rate to almost a third of those employed in this profession. A key factor in the demographic shift in the composition of pharmacists in Israel relates to the changes in higher education opportunities among the Arab Israeli population. Following the signing of the peace treaty between Israel and Jordan in 1994, Arab Israelis found the door open to enter institutions of higher education in Jordan. Several groups took advantage of this opportunity: those who did not take the psychometric exams in Israel; those who could not meet the university entrance requirements; or especially women, who preferred studying in an environment matching their life style. These foreign graduates then returned to integrate into the Israeli labor market. In fact, more than one-third of the licenses issued since 2005 (for Jews and Arab Israelis) were to graduates of Jordanian institutions. For Arab Israeli graduates, though, it can be quite difficult to find an internship, and the search can take anywhere from one month to as long as two years. The process is especially difficult for graduates of Jordanian universities for several reasons. First, they cannot gain experience during their studies by being a pharmacist’s assistant, which paves the way to an internship. Another reason is that many Jewish employers are concerned about the quality and level of pharmacy studies in Jordan. These difficulties lead Arab Israeli pharmacy graduates to compromise on their internship placement, oftentimes to begin working for no pay (which is illegal), or even to work as an assistant- a position that is usually reserved for students. According to the Taub Center study, the job search is also much longer for Arab Israeli pharmacists than it is for Jewish pharmacists, although it is considerably shorter than the search for an internship. The main reason for this, as explained in the interviews, is that Arab Israeli pharmacists tend to stay on in their place of employment after the internship ends. In contrast, Jewish pharmacists tend to switch their place of employment after their full accreditation. 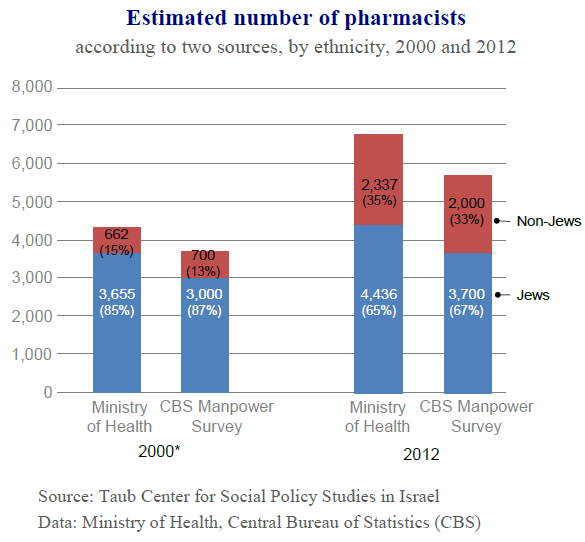 Of those interviewed, only 8% of the Jewish pharmacists continued to full employment where they interned, compared to 33% of the Arab Israelis. As Lewin-Epstein, Kalev, Maratz and Slonim note, despite their high level of representation in the profession, Arab Israelis are underrepresented in management positions. Of those interviewed, 47% of the female Jewish pharmacists had management roles, while no female Arab Israelis were in these positions. 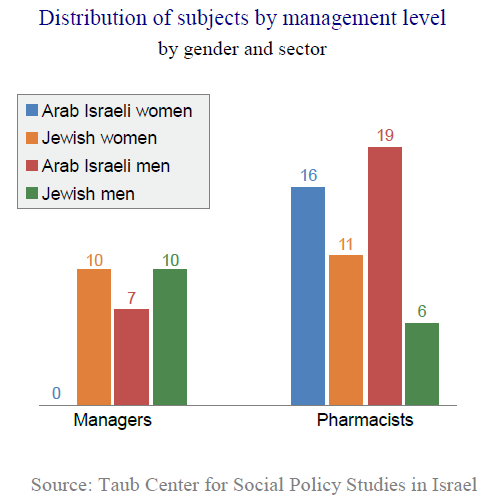 Among men, 27% of Arab Israeli pharmacists held management positions, as opposed to 62% of male Jewish pharmacists. This can be partly explained by the fact that among those interviewed, the Arab Israelis were, on the whole, younger than their Jewish counterparts and so had not yet had enough time to be promoted to management positions. According to the interviewees, Arab Israeli pharmacists are advanced equally to management positions within the pharmacies. When looking at more senior positions involving decision making or regional management, though, those interviewed felt that there are almost no Arab Israelis in those positions. As Sayid said, “There is nowhere in the medical field (pharmacy field) in Israel, whether the organization is a chain or an institution, where the manager is an Arab Israeli. It just doesn’t happen.” There is also a feeling of discrimination regarding employment by large pharmaceutical companies. According to those interviewed, pharmaceutical companies make army service a requirement for hiring and thereby effectively exclude Arab Israelis. The Taub Center study highlights that among female pharmacists, differences are substantially greater in pay between Jews and Arab Israelis. It is highly likely that the differences seen were due to professional seniority since the majority of female Arab Israeli pharmacists only entered the profession in the last few years. As noted, the research sample did not include any female Arab Israeli pharmacists in management positions, that is, the sample did not include those at higher wage levels. In general, from the interviews certain ethnic issues came up, like dealing with dress habits or the use of Arabic between colleagues at work. The big picture, though, is encouraging to some extent since it indicates a level of collegiality and cooperation on the basis of professionalism. Furthermore, the direct contact at work between Jewish and Arab Israeli pharmacists leads them to get to know and respect one another. In contrast to professional relations on the job which are for the most part characterized as positive, tensions between Jewish customers and Arab Israeli pharmacists are more common. From the interviews, it appears that customer dissatisfaction is often expressed in terms of the pharmacists’ ethnic group. As many of those interviewed said: “When you are arguing with someone and you don’t want to give them something because there is a problem, the customer will suddenly say, ‘No, you don’t want to give it to me because you are an Arab.” According to the study, the most important thing in these types of cases is how the system responds; many times pharmacists do not have the full support of their employer, and the customer service policy is sometimes perceived as requiring the acceptance of prejudice. Another systemic problem that needs to be addressed is the issue of Muslim holidays. In most cases, pharmacists say that their needs are taken into consideration by employers and colleagues. It seems, though, that there is no organized policy surrounding this issue, and those who cannot find someone to take their shift must work even on their religious holidays. As has been said, some employers are reluctant to give internship positions to Jordanian graduates, either out of fear that the quality of their training is lower or because graduates are not familiar with the local labor market. To remove these obstacles, the researchers recommend that the state run special training programs for these graduates to acquaint them with the local pharmaceutical market, and also to act as a bridge between employers looking for interns and Arab graduates. The authors of the Taub Center study also recommend that the state subsidize internships, especially for honors students from Jordan. These steps serve not only the Jordanian graduates but also the state, which has not opened additional pharmacy schools due to its reliance on foreign graduates. Religious and religious-holiday rights – public policy can act to protect and enforce religious rights of workers. One step is to raise employee awareness of their rights to vacation days on religious holidays and overtime pay for working on holidays, as set in law. The researchers recommend developing policies that take into consideration the difficulties of the month of Ramadan, and that requires an employer to take steps like ensuring certain work days with shifts that allow for the fast and also allow longer breaks for food, with pay, for those who consent to work the evening shifts. Abuse by customers – thegovernment is currently considering a law against abuse at work that requires the employer “to deal efficiently with cases of abuse in work relations that come to the employer’s attention, as well as to try to prevent a recurrence of abuse and repair any damage caused following such abuse.” Advancing this law, as well as raising awareness among pharmacists and their employers is crucial and will help create a safe environment that can help limit the damage of such experiences. For details, or to arrange an interview, please contact Itay Matityahu, Director of Marketing and Communications 054-290-4678.